Nike will soon add a new shoe to their esteemed basketball roster. The FitAdapt-enabled second rendition of the HyperAdapt, which they are calling the Nike Adapt BB, is dropping next month. The model’s marquee feature laces and tightens each shoe to an ideal fit once the wearer’s foot hits a heel sensor, adapting to movement and activity in real time. Speaking practically, FitAdapt removes the need for tying and adjusting laces mid-game— you'll never waste a time-out again. The release stands as one that could create a ripple effect throughout the rest of the sports footwear industry for years to come. The shoe will be released on February 17. They will hit the market at a standing-ovation-worthy price point of $350, affordable and accessible to the casual collector and curious athlete. When Nike's first rendition was previewed about three years ago, a price tag carrying twice that number lead some enthusiasts to put-off the tech as economically unattainable. They should have known better than to doubt the innovative minds at Nike. Tinker Hatfield, legendary Jordan designer, for example, has been part of the HyperAdapt story since it's inception. Nike's popular breathable flyknit shroud stretches over the top of the design while exaggerated branding on the outer edges of the shoe give it a modern minimalist vibe to match the complex tech hidden inside. Currently shown in a black/white/platinum colorway, we can expect splashier options to be added at launch or soon after. Each pair comes with a wireless charging mat. They can be preordered on Nike's website with a NikePlus login. In men's, women's, and kids' sizes, Nike proves it's serious about the Adapt BB and its place in their lineup going forward. This isn't gimmicky costume tech. It's digitally-infused performance wear for today's plugged-in generation of hoopers. They're also a sparkling addition to any sneaker collection, bringing electronics into the fold, tastefully, for the first time ever. The basketball world, for one, has already taken notice. Future ruling-class of the NBA, Jayson Tatum, De'Aaron Fox, and Kyle Kuzma were recorded in a video promo sharing good-natured expletives while delighting in their first HyperAdapt fitting. Fox demonstrated connectivity to his smartphone, a feature allowing users to set and save specific fittings for times and places, like pregame, crunch-time, or rehabilitation scenarios. 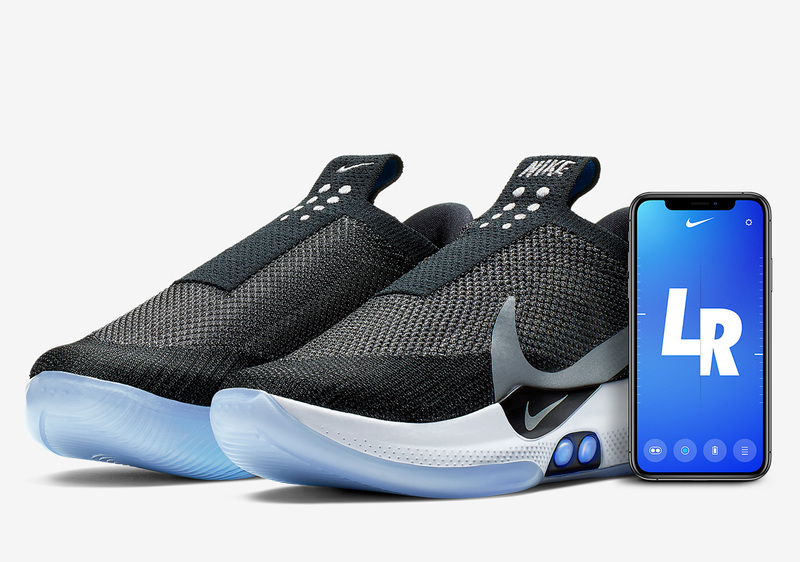 With Nike's Adapt app, you'll also have freedom to customize the shoes' LED lights, download software updates, and monitor battery life. Tatum has been selected as Nike's test pilot; he'll be lacing-up the Adapt BBs for game action, or not, for the first time this week, in a marquee match-up with the conference-leading Raptors. From far-fetched movie prop to far out footwear execution, automatic laces have been a buzzworthy subject in sneakerhead circles for decades. With this release, they're finally here; nearly thirty-five years after Marty McFly captured our imagination sporting a version of his own in Back to the Future. One can only imagine the BB's already smooth internal lacing machinery to become better intertwined into the shoes' structure in the future, eventually becoming invisible to the casual user. This would enable FitAdapt tech to be utilized in more, or all, of their industry leading signature lines, like those designed for one-name-greats, LeBron, Kyrie, and even Jordan. Visit our Nike section to find a deal that you can use when the shoe comes out officially to the public on February 17.